In Between Screaming, There are Important Words is a performance of yelling into a mic and listening through a boneconductor simultaneously in order to examine and reproduce the experience of echo chambers in family conflicts; this project was also a discursive exploration of micro aphorisms and the potential creative sound opportunities of bone conductor transducers. 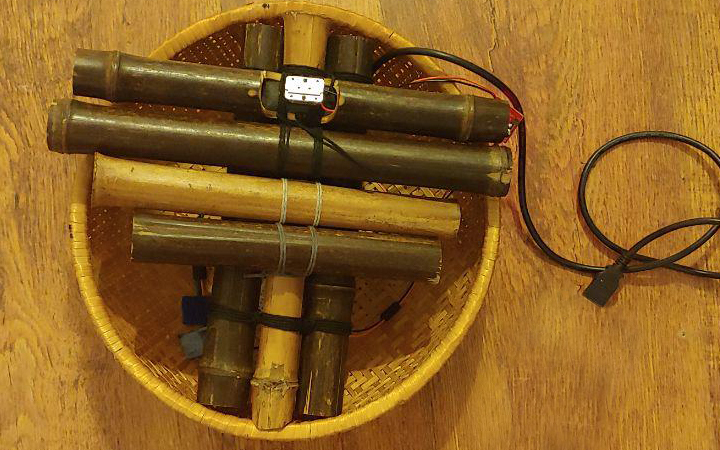 Shout to Listen is a performance sound piece involving me and any willing viewers to yell and sometimes whisper into a sculptural bamboo/rattan basket in order to experience and listen to the narrative output in the bone conductor transducer. You kneel into an almost worship like pose in order to place your forehead against the boneconductor and you speak into this cultural artefact I have constructed from a lashed black bamboo wall held inside a readymade rattan basket. Shouting results in a shouting audio piece back. 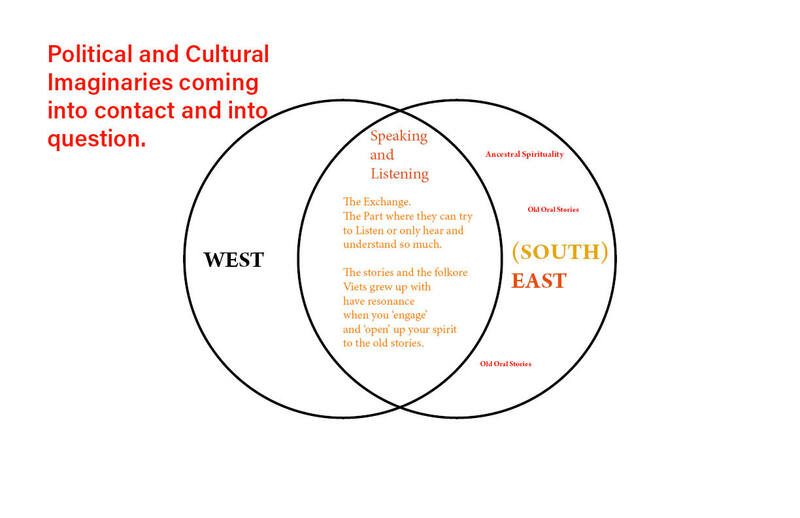 whispering results in a whispered back vietnamese aphorism. 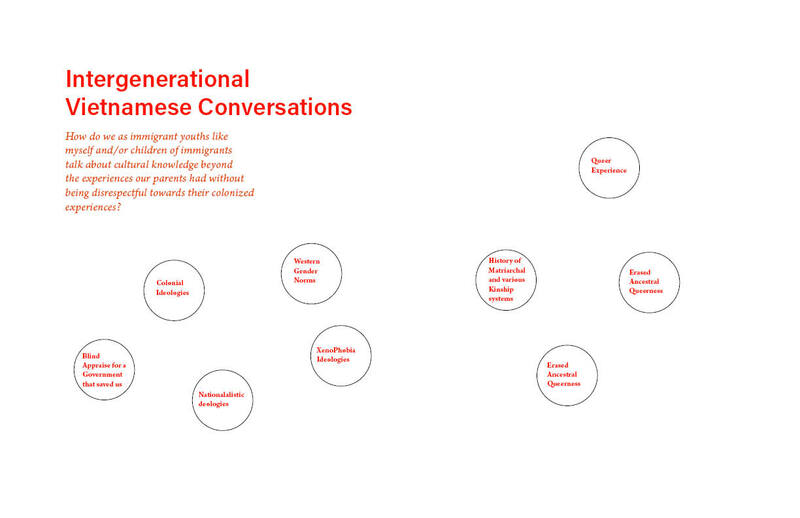 The curated experience is rooted in my experience of intergenerational conflict in immigrant families. This piece is meant to simulate ​a shouting match and capture the few moments that have occured in family fights where amid screaming, there are words that slip through and are heard that stick and resonate for years onward. The performance piece only 'engages' once a viewer engages their voice into the experience. Besides the necessary voice contact, the humbling act of kneeling and bowing your upper torso forward into 'worship' or rather 'submission' position activates the experience of humbling oneself in order to submit to the narrative and to also perverse the orignal context of the art creation. In other words, the context before engaging the piece is: a chamber of personal and family truths unheard because unproductive 'conversations' are the norm. 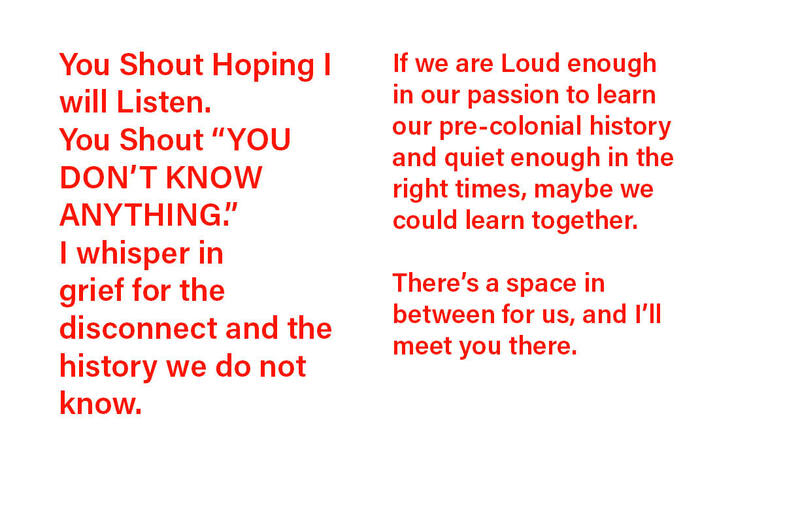 The context during or after engaging the piece should hopefully be read as: There’s a space in between for us, and I’ll meet you there (quote in text image in image gallery above). The activation of the piece occurs when someone screams, yells, and/or lastly whispers into the piece. If this activation occurs in the order just mentioned, the intended feelings should remind us of: anger, grief, guilt, and yearning. In addition, the pose is a reference to the religious piety that sometimes blinds our ancestral spirituality, a spirituality beyond and older than established religion that was only introduced to our country during colonialism. Yet at the same time, even though my family is Catholic, I have seen this pose often and it is more similar to Buddhism's 'three steps one bow' than any european religious ritual. I've seen many of my family members perform this buddhist like bow for a religion (catholicism) that is not native to our roots. It is an uncomfortable irony for me. We have forgotten old traditions, and some of our history has been erased, and now what I have in my family is a bow to the unfamiliar and disconnected. Nonetheless, there is some kind of hope I still find in this pose. Our family and even myself have prostrated ourselves to apologize to our elders when we have done wrong. These connections are meant to serve the idea of humility that we all need in order to spark conversation and understanding. The exploration of yelling to listen through bone conduction is integral to the creative process of the piece. During prototyping, I spent hours yelling, talking, and whispering into the mic in order to grasp the different feelings of hearing the similar or differering tones back. 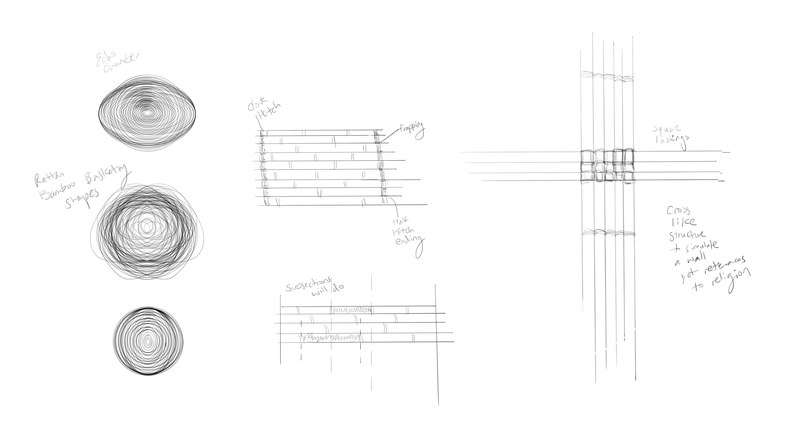 The messages I wanted to hear back was the most difficult design, since designing moments of tension and release can be tricky since most audience members would preusmably approach the piece with apprehension. 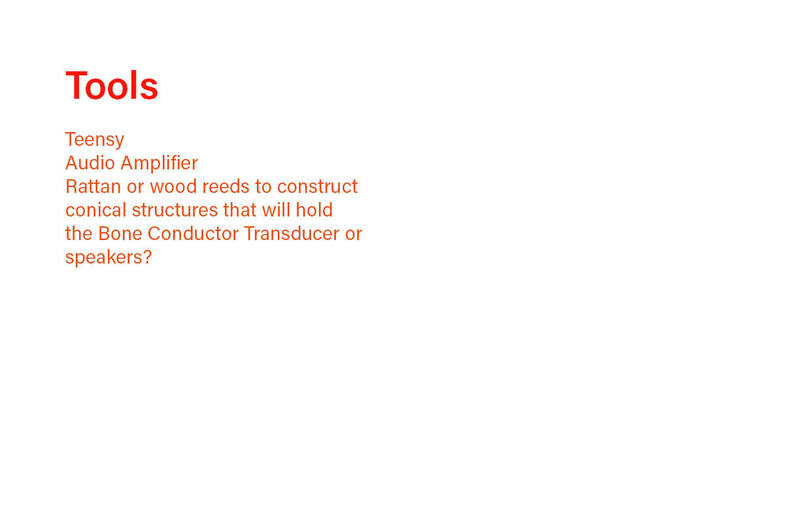 The initial prototype utilized a large sound transducer with a sound detector piece. For a few weeks I struggled to get a higher resolution output of my audio files and tinkered with many elements that changing the gain resistors, only to find out that the input + of my audio amplifier was connected to the wrong port. Anyways moving forward, much of my tests involved deciding between the large sound transducer and the bone conductor transucer. The bone conductor transducer ended up being more appropriate for the experience and for the sculptural form in which the piece would sit inside. Black bamboo pieces were had cut with Japanese saws, square lashed, and fit inside a rattan basket through a superficial fish mouth joint. Electronic components included a teensy 3.2, audio amplifier, and a MEMS mic. Initial tests with short 1- 2 second audio files stored in my teensy sd card showed the system would work how I wanted it to: play certain audio files as a person is screaming at a certain amplitude. However with my longer self-created audio files (10 - 20 seconds), this did not work as well, since audio reverb/echo was inevitable (users would be screaming through a literal basket chamber and the variations in this noise would retrigger and trigger other audio files). My two possible solutions were: cut the audio files into smaller bits and pieces, and/or play with the timer code portion more. Nonetheless, the performance worked well with two audio files (rather than the 4 I had in mind). This piece and discursive exploration of giving sound in order to roughly hear some audio back has sparked some more interest in exploring ideas of 'self-created truths', things we tell ourselves, and the internal voice we have inside our heads. I am very interested in this still young technology of bone conductors and exploring the playful opportunities of 'private' yet 'public' listening. Lam, A. (2010). 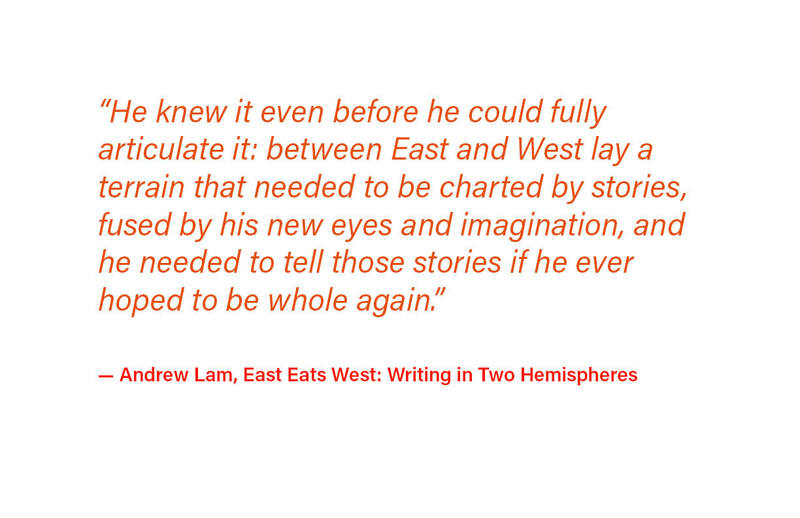 East eats West: Writing in two hemispheres. Berkeley, CA: Heyday Books.